The MDF panel construction kit (90350) contains all the wood blanks for walls, floors, and roof sections made from MDF material (medium density fiberboard) for building the "Villa Tara". The panels already include all sections for windows, doors, and stairs for the associated building elements set (90320). In addition, all the grooves for the walls and for the separately available cable ducts (22220) have already been milled into the MDF panels. This means no more sawing is required! The panels only need to be glued into the designated grooves, so no nails or screws are needed either. The floor tiling and wallpaper can (as can be seen in our illustrations) be already be applied prior to assembly. Of course the construction kit is provided "bare", so that you can select your favorite wallpaper according to your own furnishing ideas or from our extensive range. 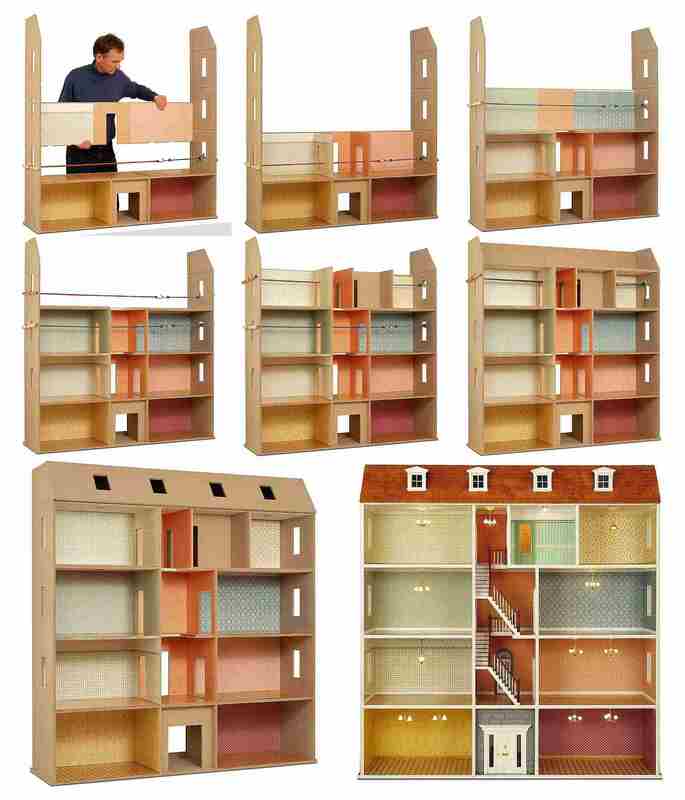 The construction elements required for finishing the "Large Townhouse" are contained in construction elements kit item no. 90320. The roof can optionally be fitted with 4 dormers as shown in the illustration. For this purpose, the construction kit includes an additional roof part already containing the required sections. MDF (medium density fiberboard) panels consists of fine natural wooden fibers and adhesive resin which are compressed to form a homogeneous, hard board material. MDF has an extremely smooth surface, doesn't chip and is absolutely dimensionally stable. We selected MDF for our house construction kits and our module box because it is better to work than natural wood panels, allowing essentially better precision with respect to the grooves and sections.